The function of a boiler is to heat your water supply and move water throughout different areas of your home or business. A boiler heats water, its send the heated water to radiators and in-floor heating, then returns back to the boiler where it gets reheated when temperatures drop. Boilers are very flexible heating options. They can be customized for a variety of different applications and functions like heating your space and giving heated water for showers, sinks etc. A boiler system can be very complex and requires maintenance. A boiler’s overall effectiveness depends a lot on the initial design and installation. Five Lions Heating & Cooling Company We are well versed in a field of designing and installing a complex hydronic boiler systems as well as boiler retrofits. Boilers are known to be the oldest types of heating. For businesses that need heating systems, boilers are the best choices for heating. 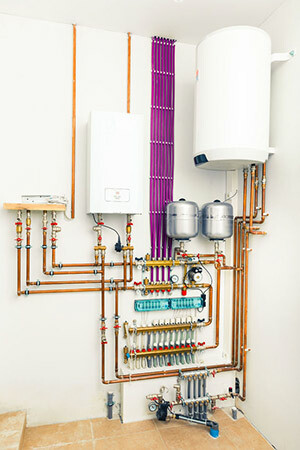 Many homeowners enjoy the use of boilers because they produce heat that is pleasant and even. Radiators that are used throughout old and new homes. Homes that use radiant in-floor heating systems. Condo’s that use a boiler for both heating and hot water. Where zoning is important such as multi-unit residential buildings. When it comes to high-efficiency boilers such as Navien, Viessmann, NTI, Rinnai and more, these have a rating of 90 – 95 % A.F.U.E (annual fuel utilization efficiency). These high-efficiency boilers are designed for wall hung, floor mounting, side wall venting and with CPVC plastic pipes. Also available for chimney venting. The high-efficiency units are ideal in multipurpose applications and can also be used in combination providing heating and domestic hot water. Mid-efficiency boilers such as SlantFin, Weil Mclain, Olsen and more have a rating of 80 – 85 % A.F.U.E . These units provide direct venting or chimney venting. Boiler systems have changed over several years, using advanced staging and digital control systems. In residential areas boilers that are used, utilize the aqua stat. In commercial areas, boilers operate with complex local controls in the systems. Allows your home to be divided into zones, with its own thermostat. Receive more even and customizable heat. Control which rooms can have heat and precise even temperatures. They are dust free and allergy friendly. At Five Lions Heating & Cooling we give you options. Most people are unaware of the variety in heating that is available to their homes being residential or commercial. We are here to provide you quality products to better suit your needs. Boilers need a good water source. 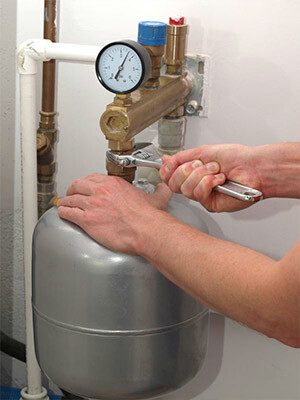 Keeping a steady source of water supply is necessary to be able to keep the water levels of the boiler at safe limits. If the safety of your system concerns you, leave the job to Five Lions Heating & Cooling. We will take care of your concern and inspect your boiler system to ensure that it is working according to safe regulatory standards. Repairing a boiler is advanced work and it is important to choose a qualified company. Five Lions Heating & Cooling operates effectively to getting the job done in a safe and timely manner. Call today and book your appointment! WARM UP YOUR HOME WITH A HIGH-QUALITY BOILER THROUGH FIVE LIONS HEATING & COOLING! © 2019 FIVE LIONS HEATING & COOLING INC. All rights reserved.